Beautiful neck piece embellished with an array of red, white and gold beads as well as clear rhinestones. Fitting for all ages. Compliments neck but stylish enough to wear on head. Royal collection set. Blue stones blend in gold chains creating an elegant look. Perfect for evening attire or the runway. Royal collection set. Red stones blend in gold chains creating an elegant look. Perfect for evening attire or the runway. Beautiful gold chain with bold clean accents. Glamorous necklace set. Perfect for casual or evening attire. Sparkling multi color rhinestones set in gold / antique blend chain. It drapes the neckline smooth. Add 2 chains to give a bolder look. Perfect for casual or dressy attire. (Note: matching bracelet is not included in the set. Select item # M1611A to purchase it.) Bold gold multi vertical strand bling necklace with earrings. Great statement piece for evening or the runway. 16' black multi layer bracelet. Brass, Gold, Semi Precious, Jade, Onyx (Retail $62.00) Elegant rose gold plated 2 piece set. Eye-catching and unique. Clear crystals set to compliment details. This fashion set screams STYLE. It is one of our DEALS. This 4 piece set is carefully detailed. High end multi color cubic zirconia stamps as a great choice in jewelry. Get ready to embrace the compliments. Stylish 2 piece gold necklace set. Detailed designs with smoked stones and silver accents. Beautifully crafted silver/rhodium pendant with high grade cubic zirconia. Eloquent Essential engraved in the back. Chain included. Perfect for all attires. 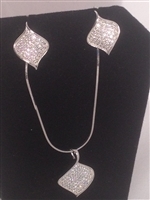 Sterling Silver necklace set with dazzling earrings and pendant. Stylish enough for any attire. 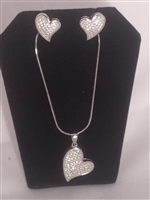 Sterling Silver necklace set with dazzling earrings and pendant. Stylish enough for any attire. Flowing sapphire blue & white high end cubic zirconia. 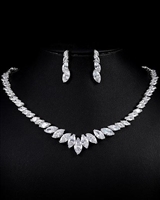 This necklace and earring set screams rich and elegant. Any attire this set compliments will truly stamp ones excellent choice of the finer things. 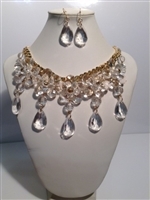 European style luxury necklace set. Geometric high grade cubic zirconia set is platinum plated and perfect for a wedding or special occasion. (Chain option available for additional cost) Gold and Sterling Silver encrusted praying hands. High class & cut cz. Fashionable pendant. 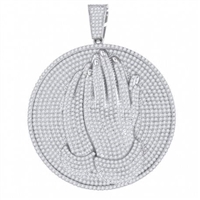 Sterling Silver encrusted praying hands on medallion. High class & cut cz. Fashionable pendant.